The CA Foundation June 2019 exam or CPT 2019 as it used to be known, is going to be on 4th June 2019 (Tentative). The application can be filled only through online mode, first by registering and creating your own ICAI student profile. The Registration process for the same will begin from 20th February 2019 (Tentative) on the official website of ICAI's portal for students at icaiexam.icai.org. You should not submit more than ONE application form for CA Foundation. If more than one application is submitted, one or all of them will be rejected. The CA Foundation 2019 exam fee once paid is Non-Refundable / Non-Adjustable. CA Foundation Application Forms that are incomplete/ unsigned/ non-attested will be rejected. You can submit the Filled up Application form in person in the Head Office or in any of the Offices of the Institute. You should download the Declaration from the ICAI website. Then get it attested by a Chartered Accountant or a Gazetted Officer or Principal of School/College and Parent/ Guardian and upload its scanned copy. The candidates will be allowed to change the Centre/Medium of the CPT examination as per the schedule above. For this, you need to upload a scanned copy of a handwritten/typed application for change of Centre/Medium duly signed by the candidate. If the photograph uploaded by the candidate is not appearing in the Application Form pdf, you can paste two latest passport photographs (size – 3.5 X 4.5 cm)– One attested and one non-attested. If the Signatures are not appearing in the pdf then Sign at specified places. Scanned copy of 10th Marksheet or Birth Certificate. Create Profile: Make your profile on the ICAI website. Login Details: Log in with your CA Foundation Registration ID and Password, Enter your details, upload images/scanned copies into the CA Foundation application form. Payment: Pay online to conclude the Application Form. Go to the ICAI's students' portal at icaiexam.icai.org. To start, click on “Register Now” and create your profile. The CA Foundation registration form will be as follows. To register online, the aspirants need to enter details such as their CA Foundation Registration Number, date of birth, mobile number, email id, etc. Submit the registration details, and the login credentials will be sent to your registered email id and mobile number. 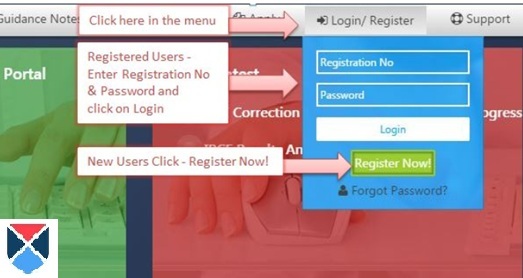 Once you receive login credentials, use those details to log in. Then, proceed to fill in details in the Application Form as shown below. After entering the details, click "save and proceed" button to create the profile. The step 2 of the profile is entering your complete address details. Make sure the details entered are correct before clicking "validate the details" first and then clicking "select details". You need to upload the scanned copy of your photograph, signature, 12th mark sheet, 10th mark sheet, and attested Declaration in JPEG format within the 100 – 300 KB size. After uploading the above documents, it is now time to "Review" the information entered so far. You have to now carefully read the "Declaration" and tick the check box "I Agree" if you agree and then click "Final Submit" appearing on the bottom right corner. This will essentially finish your application form. In case you want to make any changes in the already filled application form then click "Back To Form" button on the bottom left corner of the page. After making the necessary changes, submit the application form. In case you face any difficulty in filling the online application form, feel free to call any one of the ICAI helpline number 0120-3054851/852/853/854/835,4953751/752/753/754. You can refer to the table above to know the CA Foundation 2019 fee based on your exam center location. The fee amount will appear on the screen according to the test center you have chosen. Enter the Captcha correctly and click "Make Payment " button to pay the fee. The fee can be paid using Visa/Master/Maestro Credit/Debit Card/Rupay Card/Net Banking mode. 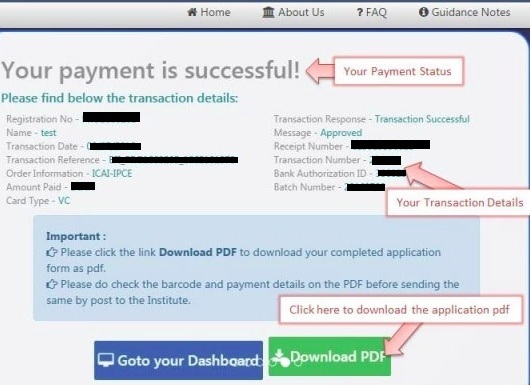 On successful payment of the fee, you will be taken to confirmation page acknowledging the same. Make sure you download the filled application form by clicking the "Download PDF" button on the bottom right corner. You should keep this copy safe at least until the admit card is released. After saving the application form, you can now proceed to go to your Dashboard by clicking the button mentioning the same on the bottom left corner. The ICAI also provides an opportunity for you in case you want to make any corrections in the CA Foundation 2019 Application Form, through a correction window on the dashboard. This facility for making corrections will be available, in two separate sessions. The first opportunity will be free of cost, whereas, in the second opportunity, you will need to pay a late fee of Rs.600 or USD 10 (depending on your test center location) to edit the details. Refund of Fee: Multiple payments made online, if any, received by the Institute, due to systemic error, for a single student (using the correct CPT registration number), will be identified by the system and excess fee received will be refunded to the credit of the respective accounts from where they originated, by ICAI, within 21 days of the last date for submission of forms. In no other condition, the fee once paid will be refunded. If Not Reached in Time: In case Print out / hardcopy of your so filled in Online Application Form, complete in all respects, does not reach the ICAI’s Office at New Delhi within the stipulated last date, you will not be permitted to appear in the CA Foundation 2019. You have to now send the printout of the Online Application Form without folding and Superscribing the envelope as "Online Application Form for 4th June 2019 CA Foundation Exam" by Speed Post/Registered Post to the ICAI address. 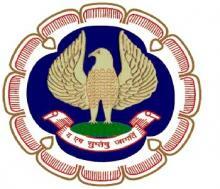 The ICAI address: Joint Secretary (Exams. ), Examination Department, The Institute of Chartered Accountants of India, 'ICAI Bhawan', Indraprastha Marg, New Delhi – 110 002, so reach before the deadline. You will be required to print the PDF of your application form. Affix your photograph and signature at the specified place on the physical print out. You then need to get them attested by a Chartered Accountant or Head of an Educational Institution or a Gazetted Officer and submit it in the normal course, in the specified format. If your photograph and signature are appearing on the PDF, then you need NOT send the printout of the PDF to Exam Department.